A hearty scam-o-welcome to the not-so-late Dr. Girard Brinkman. 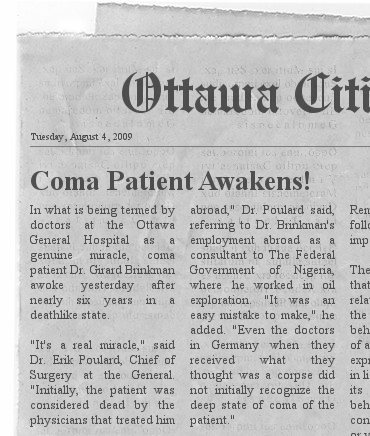 Awakening from a coma (see the attractive newspaper clipping below), he springs into action to protect his interests! I will like to solicit your help in a business proposition, which is by nature very Confidential and a Top Secret. I know that a transaction of this magnitude will Make any one worried and apprehensive but I am assuring you not to worry, as all will be well at the end of this endeavor. I am Mr. Ade Daniel, Client Service Manager of African Sun Bank, Lagos Nigeria my Partners and I have decided to seek your help in transfer of some amount of money requiring maximum confidence from my bank. A foreigner, Late Dr. Girard Brinkman who was oil merchant and contractor with the Federal Government of Nigeria until he died under a brief illness on the 26th of December 2003 he was a very good customer with African Sun Bank and had a balance of US$32 million which the bank now expects his next of kin to claim as the beneficiary. So far, valuable efforts has been made to get to his people but to no avail, as he had no known relatives more because he left his next of kin column in his account opening forms blank and he has no known relatives . Due to this development our management and the board of directors are making arrangements for the funds to be declared unclaimed and paid into the federal government purse. Usually, funds of this nature end up in the greedy pockets of some politicians due to our corrupt society. To avert this negative development my colleagues and I have decided to look for a reputable person to act as the next of kin to late Dr. Girard Brinkman so that the funds could be processed and released into his account, which is where you come in. We shall make arrangement with a qualified and reliable attorney that will represent you in liaising with my bank for inconveniency of you coming to my country. All legal documents to aid your claim for this fund and to prove your relationship with the deceased will be provided by us. Your help will be appreciated with 20% of the total sum (US$6,400,000). Please accept my apologies, keep my confidence and disregard this letter if you do not appreciate this proposition I have offered you. Thank you very much for your time. I wait anxiously for your response. Client Service Manager African Sun Bank, Lagos Nigeria Desk. All correspondence should be through my preferred email address below. Subject: I AM NOT DEAD!!! So let me say...THAT'S MY MONEY you're planning on giving away! In fact, there should have been $38 Million, not the $32 Million you spoke of, and I'm a little peeved that it's gone missing! I don't want 20 percent of it, I want it ALL, and I WANT IT NOW! I will of course reimburse you for any fees that are incurred that are reasonable. I'm still in the hospital under observation, but my cousin brought me a laptop to use. I don't have a phone or a fax number for a couple of weeks, because that's how long they tell me I'm going to be here. After that, I'll set something up, though I'll be staying with my cousin and his family, and I won't give you their number, I don't want them to be bothered with this stuff. Now talk to whoever you have to talk to, and get back to me with what the next step is quickly. I'm going to have medical bills here, and I'll need access to that money. GET YOUR PAWS OFF MY BANK ACCOUNT!!! Copyright © 1999-2016 Scamorama. All rights reserved.